The Cape’s most accessible wilderness reserve has enough variety and interest in its 50,000 sq.km of savannah and fertile riverine flats to keep a visitor occupied for weeks. Lakefield is the second largest national park in Queensland, after the Simpson Desert. It is reached via a sealed road from Cairns via Mount Carbine to Lakeland and from there by gravel road to the township of Laura. It’s numerous rivers and streams empty into Princess Charlotte Bay, which teems with birds, crocodiles and barramundi. Nearby are impressive examples of ‘Magnetic’ anthills. Painstakingly constructed by myriad tiny creatures, these towers are aligned north-south to provide shelter from the sizzling rays of the noonday sun. They stand like rigid military guards overlooking the stark but hauntingly beautiful dry savannah. By way of contrast, countless lagoons and waterways throughout the park provide many opportunities for wildlife watching. 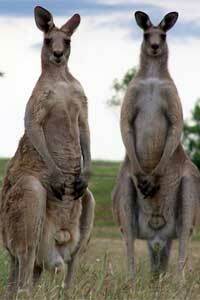 Kangaroos are plentiful here, along with varied bird life and both freshwater and saltwater crocodiles are common. Around the park’s waterholes there is an unholy cacophony of sound from thousands of ducks and geese. Brolgas dance in mysterious leaping love rituals on the plain, while tall, stately jabirus stalk through swamp grass in search of tasty morsels. Birds of prey constantly circle overhead, soaring on thermals, ever watchful for a furry movement on the ground. In the rainforest, some of the 180 bird species in the park are very active and colourful to watch, like the pheasant coucals, pigeons and parrots. Agile wallabies and the odd elusive kangaroo hop into view and countless noisy and fearsome-looking flying foxes burst out of canopy roosting areas, blotting out the sun momentarily, as they search en masse for nectar and fruit. 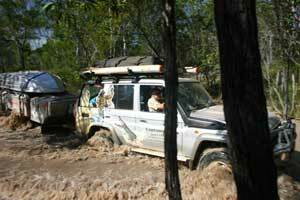 For 4WD enthusiasts there are challenges aplenty. Two popular off-road routes through the park are the 170km track from Laura to Musgrave Roadhouse and the testing Battle Camp road to Cooktown. The park has a great selection of isolated campsites for self-sufficient travellers. Kalpowar Crossing, near Lakefield, has showers and toilets but others are more basic but very picturesque. Examples are Horseshoe Lagoon, 12-Mile Hole and Hann Crossing. Further along the Peninsula Development Road, half an hour north of Coen, a turnoff leads 90km to Rokeby National Park. Once again you will find a bewildering array of vegetation and wildlife types. Along the course of the Archer and Coen rivers are stands of tropical rainforest, open eucalypt woodland and melaleuca swamps. Swimming needs to be restricted to shallow rapids, as the crocodiles are just too friendly in the deeper waterholes.